The spacious one, two and three bedroom Chapel Hill apartments at Camden Governor's Village offer homey features such as crown molding, arched entryways, large bathtubs, and a full-size washer and dryer. And if you're looking for more space in Chapel Hill, we have beautiful two-level townhomes with garages. Enjoy a relaxing day at our resort-style swimming pool or work up a sweat in our fitness center that includes cardio equipment and free weights. There’s even a two-story loft-style community room that can be rented for you and your guests with a full kitchen, dining area, billiards table and dart board. After a fun filled day in our amenity spaces, come home and breathe easy. 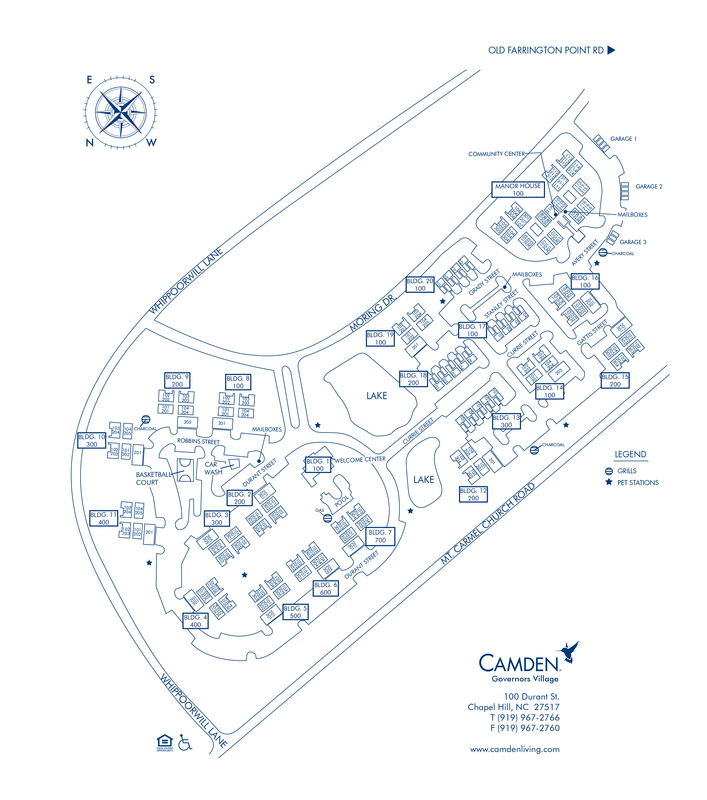 Camden Governors Village is currently in process of becoming a completely non-smoking community. With the UNC Chapel Hill campus only five miles away, Camden Governors Village residents have convenient access to all the fun shopping, dining, and entertainment of Chapel Hill. Enjoy living within the walkable Governors Village neighborhood with shops and dining nearby and adjacent park with walking trails. For fun in the great outdoors, Jordan Lake is just 15 minutes away too. A sophisticated lifestyle. Excellent customer service. A great location in the heart of Chapel Hill. It’s all waiting for you when you move into your new apartment home at Camden Governors Village. At Camden, your pets are family too! We welcome cats and dogs, up to three pets per apartment home, limited to two dogs, with a full-grown maximum weight limit of 100 pounds combined. Call us with any pet-related questions! Get the perfect spot! We have ample open parking for our residents and visitors on a first-come, first-served basis. Townhomes include attached one-car garages. Detached garages are also available for you to rent for $125 per month!